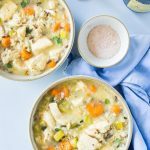 The BEST pressure cooker Chicken and Wild Rice soup recipe, it's gluten free, healthy, tasty and unbelievably easy to make in your electric pressure cooker, you just throw it all in and go! Watch the recipe video to see how to make it! it's right after the directions. Start by adding the olive oil in the inner pot by turning on the saute function on your electric pressure cooker, and adjust it to the low heat option. Don't wait for the display to say 'hot', add oil right away. Add the carrots, celery, onions, and saute for about two or three minutes, then turn off the saute function. Add the chicken broth and stir well, keep 1/2 cup chicken broth aside to mix with the cornstarch later if needed. Now add the chicken, garlic, thyme, salt, pepper and stir well. Add the wild rice blend last and on top of the chicken do not stir! It's important you add it in this order, we want to avoid the rice sticking on the bottom of the pan and causing the 'burn' notice, so adding it last and on top of the chicken should help. Lock the lid, turn the steam release vent to 'sealing' and using the manual setting, adjust it to cook for 4 minutes at High Pressure. When the cook time time is up, allow the unit to reduce pressure on its own without opening the steam release vent (Natural Release) for 10 minutes, then release the remaining pressure and open the lid. If you want to thicken the soup further after it's cooked simply mix the 1/2 cup of cold chicken broth with 1/4 cup of cornstarch and stir in after you open the pot, you can turn on the saute function if you need to to help it thicken up but usually it's hot enough right after the lid is opened. If it's thick enough already simply add back the half cup of chicken broth and stir in. I've changed the steps (but not the ingredients) for this recipe as some people have reported having the dreaded 'BURN' notice appear on their Instant Pot display, and then it fails to come to pressure. I've changed the steps to omit the cornstarch until the end to see if that helps, also adding the wild rice last and on top of the chicken to help prevent any possible sticking on the bottom of the pot. WILD RICE BLEND - If you are gluten free please ensure that the wild rice blend you choose does not have other gluten containing grains added to it, I have seen some with cous cous added to them. The Rice Select Royal Blend that I used for this recipe is gluten free.